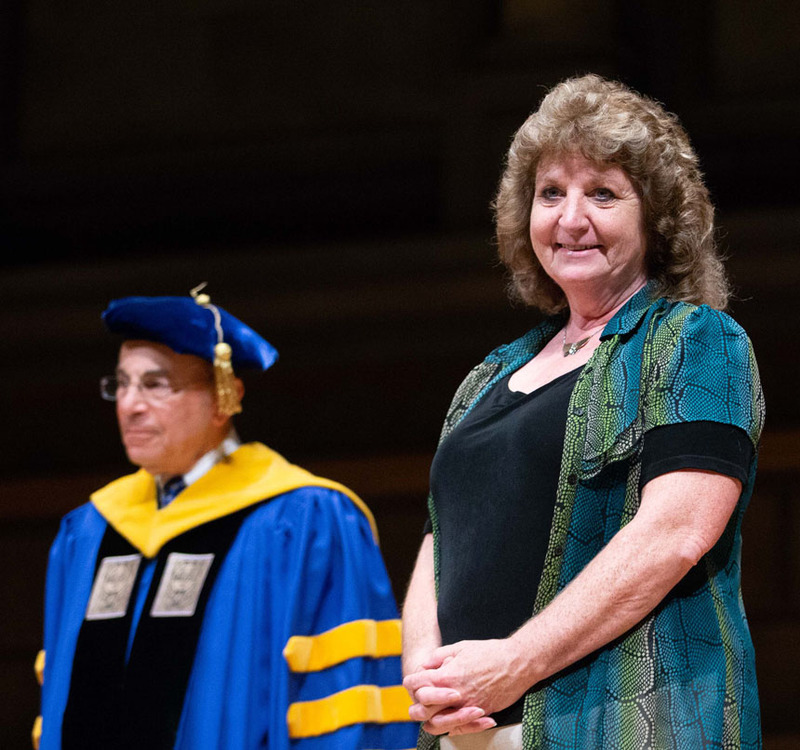 So reads the citation for her 2018 Edmund A. Hajim Outstanding Staff Award, announced by Wendi Heinzelman, dean of the Hajim School of Engineering and Applied Sciences, to loud and sustained applause at the school’s diploma ceremony. Kern, who will retire in September, has served as administrative assistant for Institute directors Duncan Moore (1987-92) and, after a hiatus to raise two sons, for Wayne Knox (2002-11), Xi-Cheng Zhang (2012-17) and Scott Carney (starting 2017). All four enthusiastically nominated her for the award, citing her unfailing warmth and friendliness, her organizational skills, her attention to detail, her willingness to work long hours – in short, her “demonstrated, extraordinary dedication” to the Institute. Her multitude of duties included managing appointments and travel for the director, handling payroll, coordinating faculty hires and awards, coordinating faculty meetings, and liaising with the Industrial Associates Program. This brought her into contact with a multitude of other people, who also appreciated her efforts on their behalf. This is reflected in several Hajim School “Bravo Chips” she received from fellow University staff members:. When Carney announced her upcoming retirement at an Industrial Associate’s meeting, he bemoaned, only half-jokingly, “it’s the end of the world for me. But it is also happy news for Gina.